”Eating well, on the other hand, is about submission. It’s about giving up all vestiges of control, about entrusting your fate entirely to someone else. It’s about turning off the mean, manipulative, calculating, and shrewd person inside you, and slipping heedlessly into a new experience as if it were a warm bath. It’s about shutting down the radar and letting good things happen. When that happens to a professional chef, it’s a rare and beautiful thing. 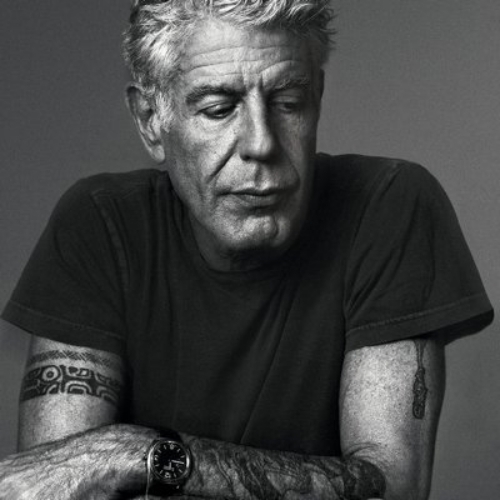 Anthony Bourdain took his own life on June 8th, 2018, in the Le Chambard Hotel in Kaysersberg-Vignoble, Haut-Rhin, France. When I heard the news, I was shocked, and then I was surprised that I was shocked. 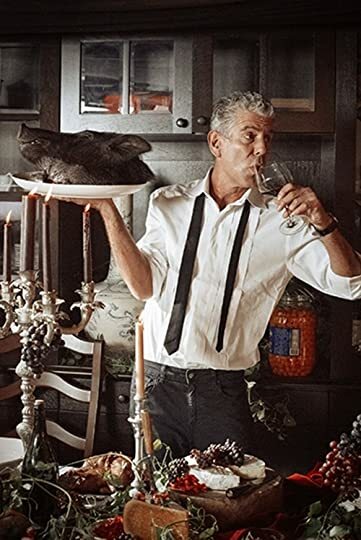 I’ve been following Bourdain’s career since his show No Reservations launched on the Travel Channel. I even watched the shorter lived Layover, but where he really put his best work together was when he moved to CNN and launched Parts Unknown. I gleefully read his first book Kitchen Confidential and came away from that reading thinking I should have been a CHEF. They seemed to be the epitome of cool! I can only imagine how many people have been inspired to try to make a living in the food industry after reading Bourdain’s incendiary book. In the 1980s, chefs started to become rock stars, and Bourdain rode that wave of expanded interest better than just about anyone. He was bright, witty, sarcastic, unafraid of the camera, and even willing to be embarrassed to give his audience more entertainment value. He was acerbic, mean spirited, world weary, kind, thoughtful, and honest about his true beliefs. Certainly, there was a part of me that wanted to be him because his life seemed so free, so uninhibited, so epically fulfilling. Like some medieval maps though, there were parts of his life labelled... here be dragons, here be demons. He’d been a junkie, a petty thief, a man of uncertain character. His story was one of remarkable self renewal, a rediscovery of purpose. A phoenix rising from the ashes. The demons in his head had never left. They were in a dark corner of his brain doing push ups, lifting barbells, hitting punching bags, skipping rope, getting ready for the moment when someone leaves the gate unlocked. This book is a collection of essays, all originally published prior to 2006, that Bourdain had written mostly for magazine publication. In these short pieces, he was angry at one moment and exuberant in the next. He was mad at obese people taking up too much space on a subway or a plane. He was dismissive of other celebrity chefs. As expected he shared the details of wonderful meals he had eaten in exquisite, mouth watering detail. He instructed us on how to interact with the wait staff at restaurants and believe me some people need some help with this. He tried to eviscerate food in Las Vegas, but soon learned to appreciate it with grudging respect. Anthony Bourdain was a lot of things, but he was not a snob. He loved Vietnamese food and admitted that great Vietnamese food can be found all over the world, but the rapture of eating pho or bun cha on a cheap plastic stool in the street is a whole different experience. ”But Vietnamese food in Vietnam, when outside the window it’s Hanoi--a slice of an apartment building with faded, peeling facade just visible across the street; women hanging out laundry; the chatter of noodle and fruit vendors coming from one flight down; the high, throaty vibrations of countless motorbikes…” All of that natural gritty ambiance added to the eating experience. I always say books are never just books, and food certainly is never just food. Once I’ve experienced great food in a country and I taste it again, even at my own dinner table, the memories of eating that dish in Scotland, San Francisco, Budapest, Paris, Rome, Prague, or New York still haunt my tongue and elevate my enjoyment of that food beyond just the flavors and spices that make it great. The Works of Ross MacDonald. 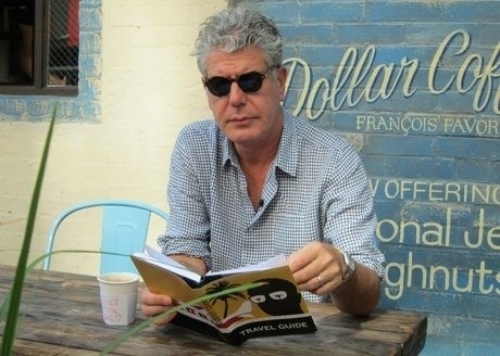 Bourdain was, without a doubt, a serious, dedicated reader. While reading this book, every time he says something like ”Every day that Gabrielle Hamilton (owner of the restaurant Prune and author of Blood, Bones, and Butter) likes me? It’s reason to live” or he reacts to something by saying that it is worth hanging yourself in a hotel shower, I felt a sharp pain in my stomach. I watched the eight episodes of season eight of Parts Unknown this weekend, and sprinkled throughout those episodes are several moments where he says, ”It’s a reason to live,” which of course carried a poignancy, knowing that on June 8th, 2018, he had run out of reasons to live. I’ve heard psychologists discuss the signs of suicide, but those signs could be applied to just about everyone I know. As a nation, we are so unhappy and stressed out of our minds that it shouldn’t be a surprise to us that the suicide rates have reached epidemic proportions. On average, there are 121 suicides a day in the United States. If 121 people a day were dying from say Avian Flu, we would be freaking out. I’m sure all of those people showed “signs.” I’m sure I show signs on a weekly basis, like every time I look at my TBR stacks, but I would be equally depressed if I didn’t have stacks of books waiting TBR, as well. I can always count on books being a reason to live. 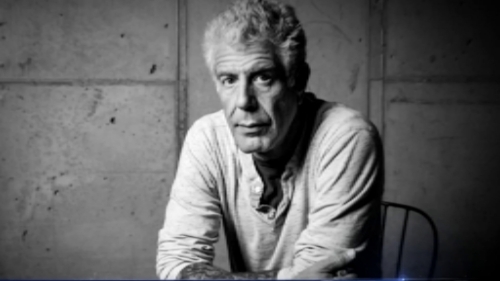 Anthony was in a dark place for the few days before he killed himself, but he was routinely depressed. So how do any of us know what THE sign is? How do we gauge the point with which a friend or family member has reached the tipping point? Anthony Bourdain’s suicide seemed so impulsive. What if he had been able to wait just one more day? I have no doubt that he had planned it, thought about it, considered it many times over his lifetime, so like a good sous chef, I would bet he had done his prep work. For all his brash, prickly exterior, it was evident to those of us who have followed his career for a long time that all of that toughness was just a shell hiding the kind, gentle soul beneath. There was more than a bit of the romantic poet in him, maybe more Byron than Shelley. He could be a harsh critic, especially on himself. In the closing pages of this book, he criticized each of these articles and explained some of the external and internal forces that were conspiring to influence his writing at the time. He offset the cynical, seen-it-all attitude with a lyrical, jubilant, almost boyish awe of those he admired, whether they be a chef, a writer, a painter, a musician, a taxi driver, a bartender, or a Mexican dish washer. I haven’t forgiven him yet. His mother, in an interview after his suicide, said, “He had everything. Success beyond his wildest dreams. Money beyond his wildest dreams.” I can feel the confusion and anger in his mother’s words. It is selfish for me to be angry at him, but I am. I needed him out there flailing away at the world and being at least one bastion of sensible truth against the Left, the Right, and the preconceived notions of small minds. He took joy in being wrong about a place or a person, especially when he found out a place he had dismissed had hidden gems or a person he had dissed had hidden depths. The way he saw the world was frankly inspiring. A person might first watch his show for the travel or the food, but once hooked, they kept watching for the insights into foreign cultures, the real people, the commentary on global politics, the philosophy about living a good life, and the friendships that are available to all of us if we are open to having them. He gave us hope for what our life could be. Did we fail you, Tony? Did we disappoint you? My compass might be spinning, but I’ll eventually get it locked back into due North again. What else can I do?